The Congressional Budget Office (CBO) released new ten-year economic projections today, updating its projections from April. The latest projections show a very similar path to previous estimates: relatively high economic growth in the near term with longer-term growth settling at under 2 percent. In other words, CBO continues to project a near-term economic sugar high followed by slow but steady growth. 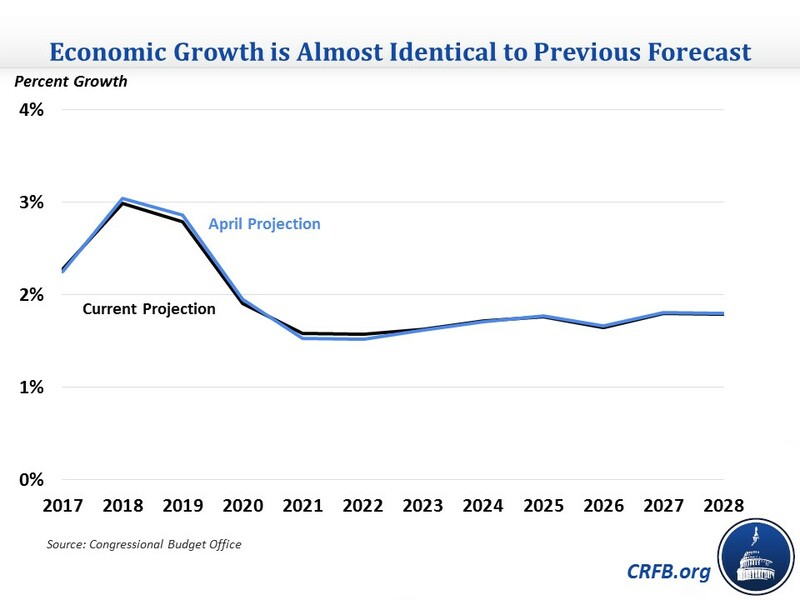 Though CBO did not update its budget projections based on the new economic forecast, we estimate that incorporating the new growth and interest rate projections would leave the fiscal picture largely unchanged, with debt increasing from 78 percent of GDP in 2018 to 95 percent by 2028 – slightly lower than the 96 percent CBO forecasted in April. CBO projects that economic growth will be relatively high for the next two years before settling at a lower long-term average. Specifically, annual (average) real GDP will grow by 3 percent in 2018 and 2.8 percent in 2019 before falling to 1.9 percent in 2020. Growth will hit a low of 1.6 percent in 2022 and then average 1.7 percent over the 2024-2028 period. During the 2018-2028 period, growth will average 1.93 percent. The latest forecast is very similar to CBO's April forecast. The growth rates in 2018 and 2019 were projected to be 3 and 2.9 percent, respectively, and average growth over the 2018-2028 period was also 1.93 percent. Looking closer at the determinants of potential GDP growth, CBO estimates that potential labor force productivity will average 1.41 percent over the 2018-2028 period, which is similar to the 1.42 percent estimated in April. Capital services growth will average 2.25 percent – similar to the previous projected average of 2.27 percent. Labor force growth will average 0.53 percent over the 2018-2028 period, identical to the average projected in April. Related to labor force growth is the unemployment rate, which is also similar to the previous forecast. Unemployment is projected to average 3.8 percent in 2018 and bottom out at 3.4 percent in 2019 before returning to around 4.8 percent later in the forecast, compared to 3.8 percent unemployment in 2018, a low of 3.3 percent in 2019, and a steady-state rate of around 4.8 percent in the April forecast. In addition to rising potential GDP, CBO's projections also show output itself exceeding potential this year and remaining above potential levels through 2021. As we've explained before, economies can operate above their "full employment" potential levels for periods of time – especially as a result of fiscal stimulus. We previously calculated that recent debt-financed tax cuts and spending increases are responsible for about 0.8 percentage points of growth this year and 0.6 percentage points next year. *Based on GDP price index. Over the medium term, changes in interest rates and inflation will slow real growth and restore economic output to potential levels (give or take, depending on the business cycle). CBO's interest rate projections show interest rates rising slightly slower in the near term than previously projected but stabilizing at a similar level. For example, the ten-year Treasury rate is projected to increase from 2.3 percent in 2017 to 3.6 percent in 2019, peak at 4 percent in 2021, and settle at its long-term rate of 3.7 percent by 2024. The April projection had a ten-year Treasury rate of 3.7 percent in 2019, a peak of 4.2 percent in 2021, and a long-term rate of 3.7 percent. Generally, CBO's August update includes modifications to both its economic and budgetary baselines. Today's update includes only economic projections. Fortunately, we are able to use CBO's latest rules of thumb to approximate what the budget outlook will be with the updated economic forecast. We estimate, roughly, that economic changes will reduce deficits by about $150 billion over the next decade and by about $20 billion in 2028. Slightly lower interest rates and higher inflation drive the lower deficits, while the revised lower economic growth projections will add to deficits. These revisions will change budget projections very slightly. Debt will increase from 78 percent of GDP in 2018 to 95 percent by 2028, which is slightly lower than the previous projection of 96 percent in 2028. Deficits will increase from $665 billion (3.5 percent of GDP) in 2017 to $1.51 trillion (5 percent) in 2028, compared to the previous 2028 deficit of $1.53 trillion (5.1 percent). CBO's latest economic projections show an almost identical outlook to its previous forecast. This means that the larger picture remains the same: debt will grow significantly in the coming decades if lawmakers don't take steps to reduce deficits.